While rice is cooking, in small bowl, combine flour, curry powder, salt, pepper and 1/4 cup of the coconut milk; beat with wire whisk until smooth. Stir in remaining coconut milk and lime juice. Set aside. 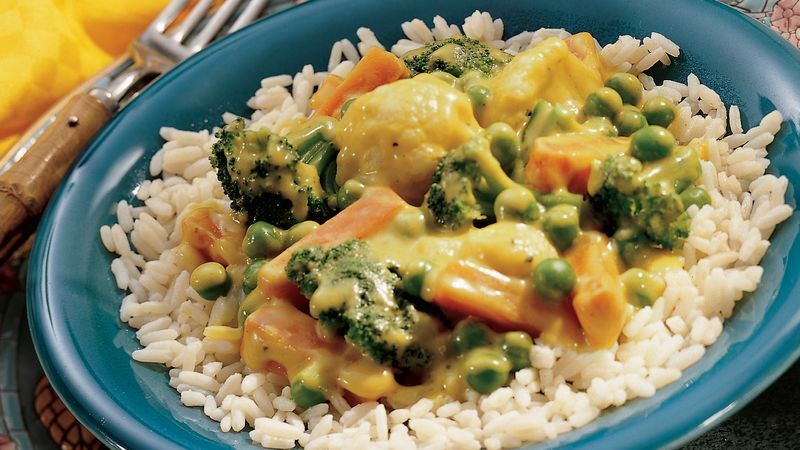 In large saucepan, combine frozen vegetables, peas and 1/2 cup water. Bring to a boil. Reduce heat to low; cover and simmer 6 to 8 minutes or until vegetables are crisp-tender. Drain; set aside. Pour coconut milk mixture into same saucepan. Bring to a boil, stirring constantly. Boil and stir 1 minute. Stir in vegetables. Cook over medium heat until thoroughly heated, stirring frequently. Serve over rice.